Special offer for InnoTrans exhibitors: Get the study for only 2.300,- € excluding VAT. Use the Code WRMS7 for the print version and WRMS19 for the digital version. 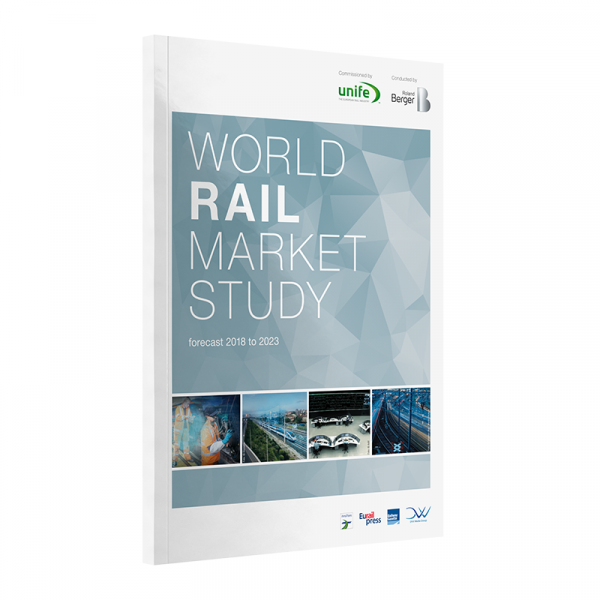 The seventh edition of the UNIFE World Rail Market Study once again provides a comprehensive view of the current status and expected development of the total and accessible world rail supply market. The study covers the market development of 60 countries, which jointly comprise more than 98% of global rail traffic, clustered into seven regions. Data for countries that are not part of the focus group has been extrapolated on the basis of track kilometres, transportation units, passenger kilometres, and tonne kilometres. The 2018 edition of the study qualitatively analyses the advantages of rail as a means of transportation as well as general trends which both increase the demand for railways and rail equipment. Rail – whether for mainline, urban/suburban, or freight transportation – has significant advantages compared to other modes of transportation. Among these advantages are the green footprint of railways, its safety record and the high capacity. Furthermore, railways can be a driver of economic growth and benefit travellers through easy access, productive travel time, and a high level of comfort. This edition of the World Rail Market Study analyses these advantages as well as the resulting implications for the rail supply industry. Beside the advantages of rail, several trends drive the growth of the rail supply industry. Megatrends such as increasing security concerns, urbanization, globalization, or sustainability have a positive effect on the demand for rail solutions. On top of that, the industry is also transformed by digitalization, artificial intelligence, e-mobility, private financing as well as liberalisation of rail operators. In the study, these trends and their expected impact on the rail supply industry will be evaluated. Take a look inside the abstract and see for yourself.